The ENERGY STAR Most Efficient 2019 designation recognizes the most efficient products among those that are ENERGY STAR certified. These exceptional geothermal heat pumps represent the leading edge in energy efficient products this year. These systems are designed to provide the best comfort for the least energy with the associated thermostat, controller, or application identified below, and EPA recommends that they are installed as such. Access the full list of products recognized as ENERGY STAR Most Efficient in Excel. 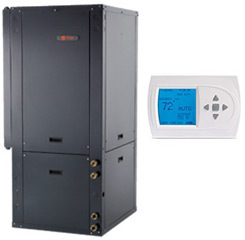 The A2GC is a dual capacity geothermal heat pump that heats, cools, and provides a portion of a home’s hot water. The communicating Premier controls work in conjunction with the dual capacity compressor and 5-speed ECM blower motor to provide comfort and savings at a great price point. These American Standard models are dual capacity geothermal heat pump that heats, cools, and provides a portion of a home’s hot water. 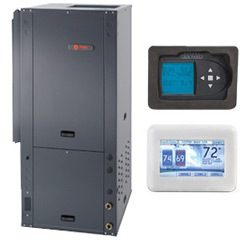 The communicating Premier controls work in conjunction with the dual capacity compressor and variable speed blower motor to provide upscale comfort and amazing savings on utility bills. 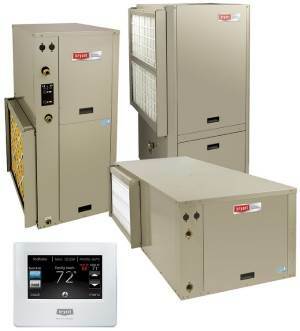 These American Standard models provide forced air heating and cooling to your home while also providing radiant floor heat and domestic hot water assistance. It’s the geothermal equivalent of a boiler, furnace, and air conditioner, all in a single unit to provide significant savings on heating, cooling, and hot water bills. These American Standard models are variable capacity geothermal heat pumps that heat, cool, and provide a portion of a home’s hot water. The communicating Aurora controls work in conjunction with the variable capacity compressor, variable speed blower motor, and variable speed loop pump to provide the utmost in comfort and savings. Dual capacity, variable speed fan with optional integrated heat recovery package for domestic hot water. 10-year limited parts and labor warranty. For the ultimate in quiet operation and comfort, consider the versatile and feature-rich Evolution Series® GC models with two-stage compressor operation and variable-speed blower. Our top-of-the-line Evolution geothermal products deliver the highest efficiencies we offer. When installed with the Evolution® Connex™ control you’ll receive optimal summer dehumidification and even temperatures. The Bryant® GZ model offers high-efficiency geothermal cooling performance and is designed to be coupled with a gas/propane furnace or fan coil. It features a quiet, two-stage scroll compressor and, in the right combination, can allow you to enjoy the benefits of Hybrid Heat®technology to gain efficient geothermal heating before switching over to gas in colder weather. The new INFINITY® series GC model combines our highest efficiency closed- or open-loop systems with the smart, powerful and intuitive Infinity Touch control. These impressive forced-air or water-to-air systems offer the quiet, comfortable benefits of two-stage and variable speed operation; the versatile programming, energy tracking and wireless capabilities of Infinity Touch; and the superior energy savings of geothermal. The INFINITY® GZ geothermal split system heat pump combines superior performance with the smart, powerful and intuitive Infinity Touch control. Utilizing a furnace or fan coil’s blower motor to move air and offers the efficiency and comfort benefits of a two-stage compressor, all tied together with the versatile programming, energy tracking and available wireless/remote operation of Infinity Touch. 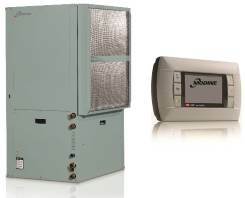 iGate™ – Information Gateway – 2-way communicating system that allows users to interact with their geothermal system in plain English AND delivers improved reliability and efficiency by precisely controlling smart variable speed components. Web-enabled configuration/diagnostics plus real-time access to system data/fault information. Patent pending Q-Mode reduces operating costs with full-time water heating in all four operating modes: cooling, heating, and hot water generation while space cooling. Game Changing - First in geothermal industry with iGate® Digital Communicating Controls AND vFlow™ Internal Variable water flow control. Two-stage capacity and water flow (Variable air flow airhandler TAH). Integrated Hot Water Generator to pre-heat domestic hot water. 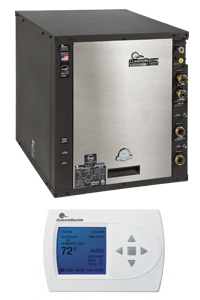 EarthLinked’s Prime Series PSC models feature a two-stage compressor, modern cabinet design, an ultra-quiet operation, Programmable Logic Controller, as well as the EarthLinked Diagnostics and Monitoring system for added reliability. The PSC provides forced air heat/cool with the perfect balance of power and efficiency for optimal comfort all year. The EDM Controller allows for zoned controlled use with the LG single-zone mini-split and Flex Multi system product lines. 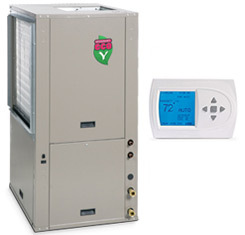 The ECO Y is a dual capacity geothermal heat pump that heats, cools, and provides a portion of a home’s hot water. The communicating Premier controls work in conjunction with the dual capacity compressor and 5-speed ECM blower motor to provide comfort and savings at a great price point. The Aston is a dual capacity geothermal heat pump that heats, cools, and provides a portion of a home’s hot water. 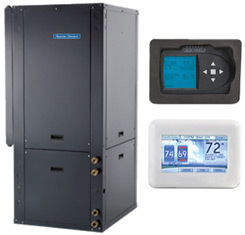 The communicating Aurora controls work in conjunction with the dual capacity compressor and variable speed blower motor to provide upscale comfort and amazing savings on utility bills. The Magnolia Plus is a dual capacity geothermal heat pump that heats, cools, and provides a portion of a home’s hot water. The communicating Aurora controls work in conjunction with the dual capacity compressor and 5-speed ECM blower motor to provide comfort and savings at a great price point. 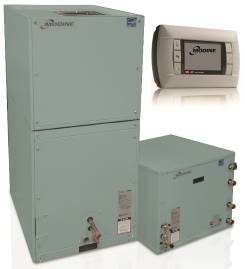 The Sycamore is a variable capacity geothermal heat pump that heats, cools, and provides a portion of a home’s hot water. The communicating Aurora controls work in conjunction with the variable capacity compressor, variable speed blower motor, and variable speed loop pump to provide the utmost in comfort and savings. Variable speed technology gives you the highest efficiencies in the industry of up to 49.1 EER. 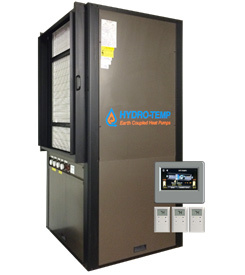 Patented Hot Water Recovery/Generation System for 100% DHW and/or 100% Radiant Applications. Variable Capacity Compressor and Variable-Speed Fan provide a whole new level of comfort control! This simple and elegant communicating color touch-screen thermostat is a great addition to any new Hydro-Temp VStar unit and offers a new level of comfort control that had previously been unattainable. These water-to-air systems offer high-efficiency, eco-friendly forced-air heating and cooling solutions. They are available in 1.5 to 6 tons in both vertical and horizontal configurations to fit in any virtually any space. 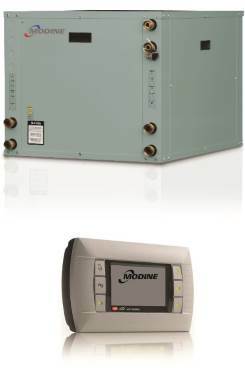 They now feature the reliable and proven Modine Controls System that is designed and engineered around the products, ensuring maximized performance. This control is specifically designed for robust conditions such as those found in classrooms or on a rooftop. The hand-held user interface makes troubleshooting a breeze, reduces staff time setting up the unit, reduces diagnostic time, and is easier to comprehend than flashing light controllers. These water-to-water systems offer high-efficiency, eco-friendly hydronic heating and cooling solutions. They are available in 2 to 12 ton capacities. They now feature the reliable and proven Modine Controls System that is designed and engineered around the products, ensuring maximized performance. These water-to-water systems offer high-efficiency, eco-friendly hydronic heating solutions. They are available in 2 to 12 ton capacities. 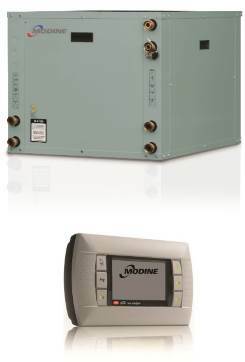 They now feature the reliable and proven Modine Controls System that is designed and engineered around the products, ensuring maximized performance. 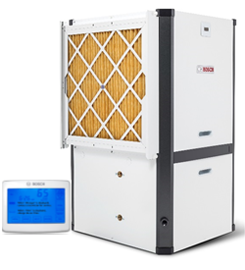 Modine GeoSync™ water-to-air systems offer high-efficiency, eco-friendly forced-air heating and cooling solutions. These units feature an industry exclusive Modine CF™ Microchannel Air Coil that offers industry leading two-stage heating efficiencies. They are available in 2 to 6 tons in vertical configurations to fit in any virtually any space. They feature the reliable and proven Modine Controls System that is designed and engineered around the products, ensuring maximized performance. These water-to-air split systems offer high-efficiency, eco-friendly forced-air heating and cooling solutions. They are available in 2 to 6 tons in both vertical and horizontal configurations to fit in any virtually any space. They now feature the reliable and proven Modine Controls System that is designed and engineered around the products, ensuring maximized performance. 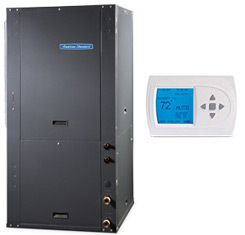 The T2GC is a dual capacity geothermal heat pump that heats, cools, and provides a portion of a home’s hot water. The communicating Premier controls work in conjunction with the dual capacity compressor and 5-speed ECM blower motor to provide comfort and savings at a great price point. These Trane models are dual capacity geothermal heat pump that heats, cools, and provides a portion of a home’s hot water. 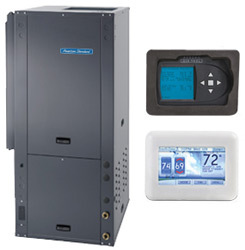 The communicating Premier controls work in conjunction with the dual capacity compressor and variable speed blower motor to provide upscale comfort and amazing savings on utility bills. These Trane models provide forced air heating and cooling to your home while also providing radiant floor heat and domestic hot water assistance. It’s the geothermal equivalent of a boiler, furnace, and air conditioner, all in a single unit to provide significant savings on heating, cooling, and hot water bills. These Trane models are variable capacity geothermal heat pumps that heat, cool, and provide a portion of a home’s hot water. The communicating Aurora controls work in conjunction with the variable capacity compressor, variable speed blower motor, and variable speed loop pump to provide the utmost in comfort and savings. 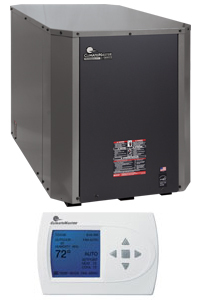 The 300A11 is a dual capacity geothermal heat pump that heats, cools, and provides a portion of a home’s hot water. The communicating Aurora controls work in conjunction with the dual capacity compressor and 5-speed ECM blower motor to provide comfort and savings at a great price point. 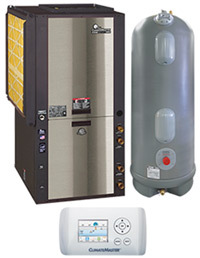 The 5 Series is a dual capacity geothermal heat pump that heats, cools, and provides a portion of a home’s hot water. 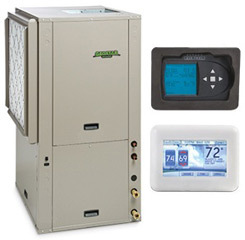 The communicating Aurora controls work in conjunction with the dual capacity compressor and variable speed blower motor to provide upscale comfort and amazing savings on utility bills. The 7 Series is a variable capacity geothermal heat pump that heats, cools, and provides a portion of a home’s hot water. The communicating Aurora controls work in conjunction with the variable capacity compressor, variable speed blower motor, and variable speed loop pump to provide the utmost in comfort and savings. The Synergy3D provides forced air heating and cooling to your home while also providing radiant floor heat and domestic hot water assistance. It’s the geothermal equivalent of a boiler, furnace, and air conditioner, all in a single unit to provide significant savings on heating, cooling, and hot water bills. Highest AHRI, GLHP efficiencies in the industry. Aurora Communicating digital controls with AID tool for real time data display, easy configuration and troubleshooting. Color Touch Screen Communicating thermostats provide user access to fault, status and energy use information. Optional variable speed flow centers and IntelliZone2 color communicating zone system. These York models are variable capacity geothermal heat pumps that heat, cool, and provide a portion of a home’s hot water. The communicating Aurora controls work in conjunction with the variable capacity compressor, variable speed blower motor, and variable speed loop pump to provide the utmost in comfort and savings. 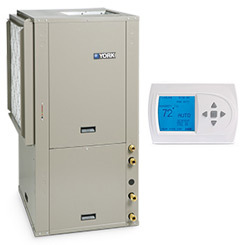 These York models provide forced air heating and cooling to your home while also providing radiant floor heat and domestic hot water assistance. It’s the geothermal equivalent of a boiler, furnace, and air conditioner, all in a single unit to provide significant savings on heating, cooling, and hot water bills. 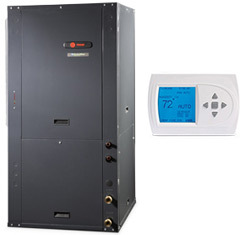 The LX Series is a dual capacity geothermal heat pump that heats, cools, and provides a portion of a home’s hot water. The communicating Aurora controls work in conjunction with the dual capacity compressor and 5-speed ECM blower motor to provide comfort and savings at a great price point. * Estimated using an average price of electricity of 10.9 cents per kilowatt hour. ** Geothermal Heat Pump lifetime is estimated at 15 years.